Chime Master intelli-Swing electrification of swinging bells. Unique systems to replace or augment rope pulled ringing. Nothing makes a more joyful sound than a peal of swinging church bells. We offer the broadest line of components available for swinging your bells exactly the way you want. 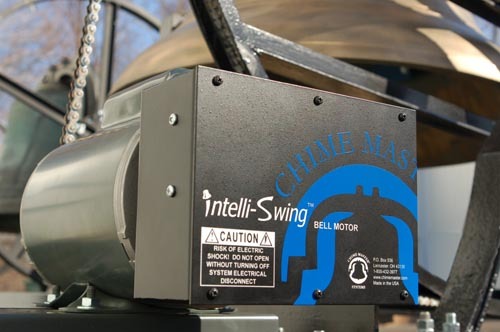 Your intelliSwing™ system can include new bells from one of our partner bell foundries or we can custom design a ringing system for your existing bells. The pendulous motion of a swinging bell requires carefully controlled and timed electrical pulses to be applied to the motor to properly start and maintain the desired swinging angle. The intelli-Swing Precision™ computer mounts on a wall near the motor to provide complete power management. This mathematically brilliant motor controller experiments and quickly learns the unique physical properties of your bell then carefully manages the energy required for perfect ringing and never overshoots the desired swinging angle.